On a chilly Sunday Morning in Starkville, Mississippi, I met up with Brianna and Jeffrey for their engagement photos. We decided to meet at the Bully statue in front of Mississippi State University’s stadium for their maroon themed session. Both are avid Mississippi State fans, so the location was perfect. We walked around the campus finding fun spots to stop and shoot. I was so excited that Brianna brought her cowbell that we incorporated into the session. For those of you who don’t know, the cowbell is a big part of MSU’s sports and specifically football team. You’ve got to ring that bell when something good happens and since these two are getting married, something great is happening! After walking around the campus, we moved our session to downtown Starkville. It felt like we had the place to ourselves as most people were still in church. The leaves on the tree were the perfect shade of orange and just brought together the cozy fall feel to their images. 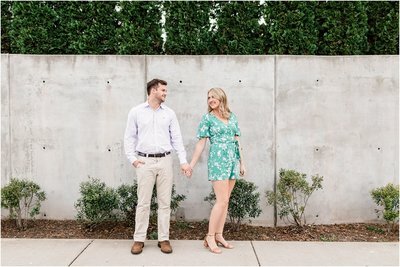 I’m so excited for these two to get married in late March at the Ivy in Flowood, Mississippi.